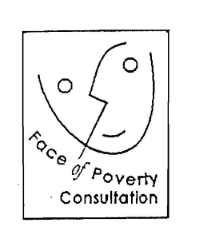 The Face of Poverty Consultation is a faith-based coalition working to eliminate Poverty. We try to educate ourselves, the members of our various faiths and members of the government about the problems of poverty by writing letters to members of the Legislature and of Parliament, attending meetings of the Standing Committees of Community Services, organizing public events and religious services, reporting to our own religious groups and cooperating with other groups who work on behalf of the poor. On Monday, November 23 at 12 noon, we will sponsor a Lunch and Learn at Fairview United Church, guest speaker Dr. Christine Saulnier talking about Food Security and the Living Wage. All are welcome, come and bring your lunch while learning. The Nov. 23 date is to recall the Nov. 24, 1989 all-party House of Commons resolution to end Child Poverty in Canada by the year 2000. October 17th is an important day each year, it is the International Day for the Eradication of Poverty. This initiative of the United Nations promotes awareness of the need to end poverty across the globe. In a country as prosperous as Canada, 4 million people live in poverty –12% of the population, an unacceptable figure. Canada has no national plan to address Poverty. The national group Dignity for All with co-leaders Canada Without Poverty and Citizens for Public Justice has developed (in co-operation with 600 organizations and 15,000 individuals) a model national anti-poverty plan which would address Income Security, Housing, Health, Food Security, Jobs and Employment and Early Childhood Education and Care. They urge the Canadian government to adopt their anti-poverty plan or to use it as a guide to develop a plan which would help all Canadians. Dignity for All created a #ChewOnThis campaign to inform Canadians of their anti-poverty plan. On October 6 (an earlier date for this year because of the federal election on Oct. 19), members of the Face of Poverty Consultation helped to spread the word of the #ChewOnThis campaign by handing out brown paper bags at the Alderney Ferry Terminal to people heading to work via the ferry. The bags contained a small packet of crackers, a Chew on This card of information, a fridge magnet, and Quick Food Facts and Food for Thought prepared by the Face of Poverty Consultation. Other groups met with members of the public at the Alderney ferry, at the Halifax Library, Victoria Park, passing out similar brown bags and encouraging people to think about ways to eradicate poverty in our country. THERE IS NO REASON WHY POVERTY SHOULD EXIST IN A COUNTRY AS WEALTHY AS CANADA. Information from Dignity for All. Halifax rated highest in household food insecurity among 33 Canadian cities in 2013 (last year for which statistics were available). Information from Halifax Food Policy Alliance—Food Counts: Halifax Food Assessment 2015. The Maritime Conference Mining the Connections Working Groups invites you to sign a petition calling the United Church Pension Board to divest from Goldcorp. See the petition below. However you may first wish to read our backgrounder, Where Our Treasure Is: The Call to the United Church Pension Board to Divest from Goldcorp . You can link to the Petition on p. 3 and p. 27 of this resource. P. 26-27 is a summary of the issues. You can also go directly to the Petition. United Church members and adherents, Pension Plan members and family members, Pensioner and family members are invited to sign. The form asks you to indicate a category - UCC member or adherent, Pensioner, Pension Plan member, community or ecumenical supporter. Signatures can be collected at church gatherings and meetings and inserted by one person who has an Email. Petition wording: We, as members of the United Church of Canada Pension Plan, Pensioners, United Church members and adherents and concerned ecumenical and community persons, call on the United Church of Canada Pension Board to divest from Goldcorp. Further we call on the Pension Board to instead invest in funds that provide a low-risk, good return on investment while also contributing to a green environment and healthy communities. A. Maritime Conference Mining the Connections Resource: Where Our Treasure Is, The Call to the United Church Pension Board to Divest from Goldcorp . B. KAIROS Website: Guatemala Mining Study Tour blog. 2) By Rachel Warden, KAIROS staff: http://www.nowtoronto.com/news/story.cfm?content=196486 , http://www.nowtoronto.com/news/story.cfm?content=196951? The first Simply Supper may be considered as “one small step” towards an Outreach to those in our community and those in the congregation, especially persons living alone who would enjoy sharing a meal with others. In other words, there was a small crowd (app. 30) at the Supper but they all commented favourably on the hearty casserole with rolls, tomato slices and watermelon. We were pleased to be supported by the congregation attendees as well as about ten people from the community. I found it revealing that one man asked if the food was going to be served at the kitchen door or could he come in. He came in, was welcomed and sat down for a hot supper. Since we had made several pans of casserole, we were able to provide “take outs” for any of the people who wanted them. The remainder of the pans of casserole, rolls and watermelon slices were taken to Feeding Others of Dartmouth on Monday morning, arriving just in time to fill their need for extra food for the noon meal. The Outreach members are a fantastic team, working for 2 hours on Saturday morning to prepare the casseroles and returning on Sunday afternoon to get the coffee, tea, cutlery, tomatoes, rolls, etc. ready. The pans of casserole gave us some concern when they were not heating up as quickly as we expected. Our culinary advisors (Brian and Tom) turned up the heat in the oven, making sure that the food did not burn, and on the dot of “serving time” at 5:15pm, produced the food that was steaming hot. Rev. Phillip formally welcomed the crowd, led them in giving thanks for the meal and directed them to the kitchen window where they were served. Several people who came back for seconds, saying that it was very good. There was also a gluten free macaroni and cheese casserole available for those who wanted it. Many, many thanks to the members of the Outreach committee who worked so willingly to purchase the ingredients, prepare the meal, set up the tables, clean the stoves and helped with the dishwashing. And who gave advice, joined in the higher mathematics of measuring out the ingredients for the recipe and remembered the little things that might have been overlooked. They even took away the garbage and compost materials. There were lots of laughs in the kitchen as we worked together. We were so grateful to the volunteers who came to help us out. 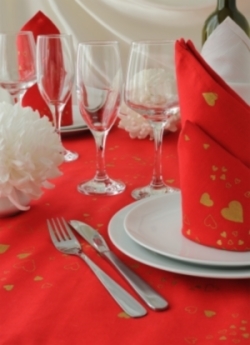 It is very encouraging to know that someone will clean up the tables and chairs after the “crew” has been working all afternoon to prepare the meal. Lauchlin Riehl and friends set up chairs after church, Gerry Gunter, Shirley and Barry Zwicker, Teri Giannou, Adelia Holloway, Ross Osborne, Jeannie Young, Carolyn Read, Marilyn Moors were there to help with the clean up operations. We want to acknowledge the Gateway Meat Market which donated all of the hamburg used for the casseroles. It was a very generous gesture on their part. Ralph Sams also provided us with rolls, margarine and milk which had been surplus to the needs of the Accessibility Fund’s Fish Chowder on Friday. Thank you to all, and watch for the posters advertising the next Simply Supper. 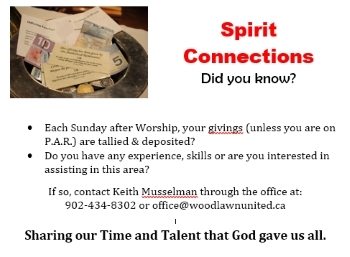 Come and bring a friend, tell others about the good free meal served at Woodlawn United church.